Smell and taste are our most misunderstood senses. Given a choice between losing our sense of smell and taste, or our senses of sight and hearing, most people nominate the former, rather than the latter. Yet our sense of smell and taste has the power to stir up memories, alter our mood and even influence our behaviour. 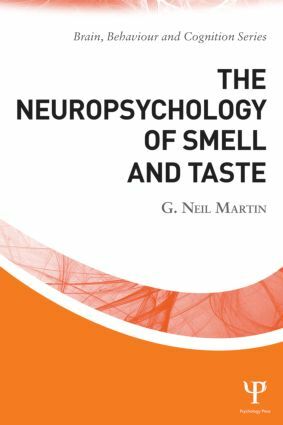 In The Neuropsychology of Smell and Taste, Neil Martin provides a comprehensive, critical analysis of the role of the brain in gustation and olfaction. In his accessible and characteristic style he shows why our sense of smell and taste do not simply perform basic and intermittent functions, but lie at the very centre of our perception of the world around us. Through an exploration of the physiology, anatomy and neuropsychology of the senses; the neurophysiological causes of smell and taste disorders, and their function in physical and mental illness, Neil Martin provides an accessible and up-to-date overview of the processes of gustation and olfaction. The Neuropsychology of Smell and Taste provides a state-of-the-art overview of current research in olfactory and gustatory perception. With sections describing the effect of odour and taste on our behaviour, and evaluating the contribution current neuroimaging technology has made to our understanding of the senses, the book will be of interest to researchers and students of neuropsychology and neuroscience, and anybody with an interest in olfaction and gustation.